The smart omega-3 source for your health. Allysian Omega™ is made with pure Neptune Krill Oil®, a premium industry-leading krill oil and sustainable source of omega-3 derived from Antarctic krill. Through an advanced patented extraction process protecting the natural antioxidants, Allysian Omega™ is the best quality omega-3 source possible. Unlike fish oil, Allysian Omega™ provides essential omega-3 (EPA and DHA) attached to phospholipids, unique to only krill oil. This contributes to superior bioavailability that is up to 2.5 times greater than fish oil. To add to that, Allysian Omega™ krill oil naturally contains 7 times more of the powerful antioxidant astaxanthin than any other krill oil. Astaxanthin has been shown to improve the way the body's immune system functions while it naturally stabilizes krill oil, quenching free radicals and protecting the krill oil from oxidation making sure Allysian Omega™ stays pure and effective much longer. The patented extraction process results in enhanced bioactives, which further improves digestibility, absorbance, and efficacy when compared to fish oil. Finally, for added benefit, the Allysian Omega™ formula is further enhanced with Resveratrol, a polyphenol compound containing super antioxidant properties with neuroprotective effects and cardiovascular health benefits. 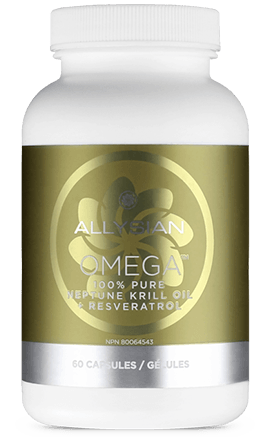 Allysian Omega™ preserves the pure Neptune Krill Oil® through a patented extraction process assuring you of quality and potency much longer than off the shelf products. The total biomass of the Antarctic krill weighs in at approximately 420 million metric tons. Allysian's Omega™ sustainably harvested krill oil respects the krill bloom and protects the normal lifecycle patterns of this incredible marine organism. Allysian Omega™ NKO® source has earned Friend of the Sea certification for its sustainable krill harvesting standards. Allysian Omega™ is encapsulated in a small sleek natural gel capsule making it easier for all to swallow. Easy to swallow and digest softgel that you won't taste after swallowing like many fish oils. Berge, R. K., Ramsvik, M. S., Bohov, P., Svardal, A., Nordrehaug, J. E., Rostrup, E., ... & Bjørndal, B. (2015). Krill oil reduces plasma triacylglycerol level and improves related lipoprotein particle concentration, fatty acid composition and redox status in healthy young adults-a pilot study. Lipids in health and disease, 14(1), 1. Ramprasath, V. R., Eyal, I., Zchut, S., Shafat, I., & Jones, P. J. H. (2015). Supplementation of krill oil with high phospholipid content increases sum of EPA and DHA in erythrocytes compared with low phospholipid krill oil. Lipids in health and disease, 14(1), 1. A potent carotenoid naturally found in krill is what gives the crustacean its pink colour, derived from the microalgae it consumes. "FDA announces qualified health claims for omega-3 fatty acids" (Press release). United States Food and Drug Administration. September 8, 2004. Retrieved 2006-07-10. “Fish, Levels of Mercury and Omega-3 Fatty Acids". American Heart Association. Retrieved October 6,2010. Kris-Etherton, P. M., Harris, W. S., Appel, L. J., & Nutrition Committee. (2002). Fish consumption, fish oil, omega-3 fatty acids, and cardiovascular disease. circulation, 106(21), 2747-2757. Gruenwald, J., Petzold, E., Busch, R., Petzold, H.P., & Graubaum, H.J. (2009). Effect of glucosamine sulfate with or without omega-3 fatty acids in patients with osteoarthritis. Adv Ther, 26(9), 838-871. Goldberg, R.J., & Katz, J. (2007). A meta-analysis of the analgesic effects of omega-3 polyunsaturated fatty acid supplementation for inflammatory joint pain. Pain, 129(1-2), 210-223. Hill, C.L., March, L.M., Aitken, D., Lester, S.E., Battersby, R., Hynes, K., et al. (2015). Fish oil in knee osteoarthritis: a randomised clinical trial of low dose versus high dose. Ann Rheum Dis, 75(1), 23-29. Maroon, J.C., & Bost, J.W. (2006). Omega-3 fatty acids (fish oil) as an anti-inflammatory: an alternative to nonsteroidal anti-inflammatory drugs for discogenic pain. Surg Neurol, 65(4), 326-331. Bhargava, R., Kumar, P., Kumar, M., Mehra, N., & Mishra, A. (2013). A randomized controlled trial of omega-3 fatty acids in dry eye syndrome. Int J Ophthalmol, 6(6), 811-816. Deinema, L.A., Vingrys, A.J., Wong, C.Y., Jackson, D.C., Chinnery, H.R., & Downie, L.E. (2017). A randomized, double-masked, placebo-controlled clinical trial of two forms of omega-3 supplements for treating dry eye disease. Ophthalmology, 124(1), 43-52. Mohammadpour, M., Mehrabi, S., Hassanpoor, N., & Mirshahi, R. (2017). Effects of adjuvant omega-3 fatty acid supplementation on dry eye syndrome following cataract surgery: a randomized clinical trial. Journal of Current Ophthalmology, 29(1), 33-38. Balk, E., Chung, M., Lichtenstein, A., Chew, P., Kupelnick, B., Lawrence, A., et al. (2004). Effects of omega-3 fatty acids on cardiovascular risk factors and intermediate markers of cardiovascular disease: summary, evidence report/technology assessment no.93. AHRQ Publication No. 04-E010-1. Rockville (MD): Agency for Healthcare Research and Quality. EFSA 2012: European Food Safety Authority. Scientific opinion: scientific opinion on the tolerable upper intake level of eicosapentaenoic acid (EPA), docosahexaenoic acid (DHA) and docosapentaenoic acid (DPA). EFSA Panel on Dietetic Products, Nutrition and Allergies (NDA). EFSA Journal 2012, 10(7):2815. Hooper, L., Thompson, R.L., Harrison, R.A., Summerbell, C.D., Moore, H., Worthington, H.V., et al. (2004). Omega 3 fatty acids for prevention and treatment of cardiovascular disease. Cochrane Database of Systematic Reviews (4):CD003177. Kris-Etherton, P.M., Harris, W.S., & Appell, L.I. (2002). Fish consumption, fish oil, omega-3 fatty acids, and cardiovascular disease. Circulation, 106(21), 2747-2757. Leaf, A., Kang, J.X., Xiao, Y.F., & Billman, G.E. (2003). Clinical prevention of sudden cardiac death by n-3 polyunsaturated fatty acids and mechanism of prevention of arrhythmias by n-3 fish oils. Circulation, 107(21), 2646-2652. Nilsen, D.W., Albrektsen, G., Landmark, K., Moen, S., Aarsland, T., & Woie, L. (2001). Effects of a high-dose concentrate of n-3 fatty acids or corn oil introduced early after an acute myocardial infarction on serum triacylglycerol and HDL cholesterol. The American Journal of Clinical Nutritio,n 74(1):50-56. Oh, R. (2005). Practical applications of fish oil (Ω-3 fatty acids) in primary care. The Journal Of The American Board Of Family Practice, 18(1):28-36. Sirtori, C.R., Crepaldi, G. Manzato, E., Mancini, M., Rivellese, A., Paoletti, R., et al. (1998). One-year treatment with ethyl esters of n-3 fatty acids in patients with hypertriglyceridemia and glucose intolerance: reduced triglyceridemia, total cholesterol and increased HDL-C without glycemic alterations. Atherosclerosis, 137(2):419-427. Calder, P.C. (2015). Marine omega-3 fatty acids and inflammatory processes: effects, mechanisms and clinical relevance. Biochim Biophys Acta, 1851(4), 469-484. Yan, Y., Jiang, W., Spinetti, T., Tardivel, A., Castillo, R., Bourquin, C., et al. (2013). Omega-3 fatty acids prevent inflammation and metabolic disorder through inhibition of NLRP3 inflammasome activation. Immunity, 38(6), 1154-1163. Yates, C.M., Calder, P.C., & Ed Rainger, G. (2014). Pharmacology and therapeutics of omega-3 polyunsaturated fatty acids in chronic inflammatory disease. Pharmacol Ther, 141(3), 272-282. Konagai, C., Yanagimoto, K., Hayamizu, K., Han, L., Tsuji, T., & Koga, Y. (2013). Effects of krill oil containing n-3 polyunsaturated fatty acids in phospholipid form on human brain function: a randomized controlled trial in healthy elderly volunteers. Clinical Interventions in Aging. doi: 10.2147/CIA.S50349. Van der Wurff, I.S.M., von Schacky, C., Berge, K., Zeegers, M.P., Kirschner, P.A., & de Groot, R.H.M. (2015). Association between blood omega-3 index and cognition in typically developing Dutch adolescents. Nutrients, 8(13). doi:10.3390/nu8010013. Burri, L., Hoem, N., Banni, S., & Berge, K. (2012). Marine omega-3 phospholipids: metabolism and biological activities. Int J Mol Sci, 13(11), 15401-15419. Ramprasath, V.R., Eyal, I., Zchut, S., & Jones, P.J. (2013). Enhanced increase of omega-3 index in healthy individuals with response to 4-week n-3 fatty acid supplementation from krill oil versus fish oil. Lipids Health Dis. doi: 10.1186/1476-511X-12-178. Schuchardt, J.P., Schneider, I., Meyer, H., Neubronner, J., von Schacky, C., & Hahn, A. (2011). Incorporation of EPA and DHA into plasma phospholipids in response to different omega-3 fatty acid formulations – a comparative bioavailability study of fish oil vs. krill oil. Lipids Health Dis. doi: 10.1186/1476-511X-10-145. Ulven, S. M., & Holven, K. B. (2015). Comparison of bioavailability of krill oil versus fish oil and health effect. Vascular health and risk management, 11, 511. Küllenberg, D., Taylor, L. A., Schneider, M., & Massing, U. (2012). Health effects of dietary phospholipids. Lipids in health and disease, 11(1), 1. Sung, H.H., Sinclair, A.J., Lewandowski, P.A., & Su, X.Q. (2018). Postprandial long-chain n-3 polyunsaturated fatty acid response to krill oil and fish oil consumption in healthy women: a randomised controlled, single-dose, crossover study. Asia Pac J Clin Nutr, 27(1), 148-157. Ambati, R.R., Phang, S.M., Ravi, S., & Aswathanarayana, R.G. (2014). Astaxanthin: sources, extraction, stability, biological activities and its commercial applications – a review. Mar Drugs, 12, 128-152. Barros, M.P., Poppe, S.C., & Bondan, E.F. (2014). Neuroprotective properties of the marine carotenoid astaxanthin and omega-3 fatty acids, and perspectives for the natural combination of both in krill oil. Nutrients, 6(3), 1293-1317. Lu, F.S., Bruheim, I., Haugsgjerd, B.O., & Jacobsen, C. (2014). Effect of temperature towards lipid oxidation and non-enzymatic browning reactions in krill oil upon storage. Food Chem, 157, 398-407. Otton, R., Marin, D.P., Bolin, A.P., de Cassia Santos Macedo, R., Campoio, T.R., Fineto, C., et al. (2012). Combined fish oil and astaxanthin supplementation modulates rat lymphocyte function. Eur J Nutr, 51(6), 707-718. Saw, C.L., Yang, A.Y., Guo, Y., Kong, A.N. (2013). Astaxanthin and omega-3 fatty acids individually and in combination protect against oxidative stress via the Nrf2-ARE pathway. Food Chem Toxicol, 62, 869-975. Fassett, R. G., & Coombes, J. S. (2009). Astaxanthin, oxidative stress, inflammation and cardiovascular disease. Future Cardiology, 5(4), 333-342. Guerin, M., Huntley, M. E., & Olaizola, M. (2003). Haematococcus astaxanthin: applications for human health and nutrition. TRENDS in Biotechnology, 21(5), 210-216. Mortensen, A., & Skibsted, L. H. (1997). Importance of carotenoid structure in radical-scavenging reactions. Journal of Agricultural and Food Chemistry,45(8), 2970-2977. Lennikov, A., Kitaichi, N., Fukase, R., Murata, M., Noda, K., Ando, R., ... & Ishida, S. (2012). Amelioration of ultraviolet-induced photokeratitis in mice treated with astaxanthin eye drops. Liu, Y., Ma, W., Zhang, P., He, S., & Huang, D. (2015). Effect of resveratrol on blood pressure: a meta-analysis of randomized controlled trials. Clinical Nutrition, 34(1), 27-34. Jang, M., Cai, L., Udeani, G. O., Slowing, K. V., Thomas, C. F., Beecher, C. W., ... & Moon, R. C. (1997). Cancer chemopreventive activity of resveratrol, a natural product derived from grapes. Science, 275(5297), 218-220. Magyar, K., Halmosi, R., Palfi, A., Feher, G., Czopf, L., Fulop, A., ... & Szabados, E. (2012). Cardioprotection by resveratrol: A human clinical trial in patients with stable coronary artery disease. Clinical hemorheology and microcirculation, 50(3), 179-187. Kennedy, D. O., Wightman, E. L., Reay, J. L., Lietz, G., Okello, E. J., Wilde, A., & Haskell, C. F. (2010). Effects of resveratrol on cerebral blood flow variables and cognitive performance in humans: a double-blind, placebo-controlled, crossover investigation. The American journal of clinical nutrition,91(6), 1590-1597. Bo, S., Ciccone, G., Castiglione, A., Gambino, R., De Michieli, F., Villois, P., et al. (2013). Anti-inflammatory and antioxidant effects of resveratrol in healthy smokers a randomized, double-blind, placebo-controlled, cross-over trial. Curr Med Chem, 20(1), 1323-1331. Carrizzo, A., Forte, M., Damato, A., Trimarco, V., Salzano, F., Bartolo, M., et al. (2013). Antioxidant effects of resveratrol in cardiovascular, cerebral and metabolic disease. Food Chem Toxicol, 61, 215-226. Chan, C.M., Huang, C.H., Li, H.J., Hsiao, C.Y., Su, C.C., Lee, P.L., & Hung, C.F. (2015). Protective effects of resveratrol against UVA-induced damage in ARPE19 cells. Int J Mol Sci, 16(3), 5789-5802. Farris, P., Krutmann, J., Li, Y.H., McDaniel, D., & Krol, Y. (2013). Resveratrol: a unique antioxidant offering a multi-mechanistic approach for treating aging skin. J Drugs Dermatol, 12(12), 1389-1394. Gobec, M., Tomasic, T., Markovic, T., Mlinaric-Rascan, I., Dolenc, M.S., & Jakopin, Z. (2015). Antioxidant and anti-inflammatory properties of 1, 2, 4-oxadiazole analogs of resveratrol. Chem Biol Interact, 240, 200-207. He, S., & Yan, X. (2013). From resveratrol to its derivatives: new sources of natural antioxidant. Curr Med Chem, 20(8), 1005-1017. Ido, Y., Duranton, A., Lan, F., Weikel, K.A., Breton, L., & Ruderman, N.B. (2015). Resveratrol prevents oxidative stress-induced senescence and proliferative dysfunction by activating the AMPK-FOXO3 cascade in cultured primary human keratinocytes. PLoS One, 10(2), e0115341. Mamalis, A., Koo, E., & Jagdeo, J. (2016). Resveratrol prevents reactive oxygen species-induced effects of light-emitting diode-generated blue light in human skin fibroblasts. Dermatol Surg, 42(6), 727-732. Ndiaye, M., Philippe, C., Mukhtar, H., & Ahmad, N. (2011). The grape antioxidant resveratrol for skin disorders: promise, prospects, and challenges. Arch Biochem Biophys, 508(2), 164-170. Pangeni, r., Sahni, J.K., Ali, J., Sharma, S., & Baboota, S. (2014). Resveratrol: review on therapeutic potential and recent advances in drug delivery. Expert Opin Drug Deliv, 11(8), 1285-1298. Soeur, J., Eilstein, J., Lereaux, G., Jones, C., & Marrot, L. (2015). Skin resistance to oxidative stress induced by resveratrol: from Nrf2 activation to GSH biosynthesis. Free Radic Biol Med, 78, 213-223. Adults take two (2) capsules, preferably with a meal, once per day. For frequently asked questions or articles visit our Help Centre. "Move, think, live with Omega™, a premium quality krill oil omega-3 and astaxanthin source with Resveratrol that can be directly absorbed into the cell membrane for superior absorption and benefits." @2019 Allysian Sciences. All Rights Reserved. Orders received before 1pm Pacific time are shipped the same business days while those received after are shipped the following business day. Delivery times are between 2 to 5 business days depending on your location. Orders received on weekends and holidays are shipped the next business day during regular hours. Orders will have a separate tracking email sent to you once the order is shipped, please be sure to enter an email address where you can receive your tracking information. We guarantee satisfaction for all of our products and customer satisfaction is our top priority. If you are not 100% satisfied with your purchase from Allysian Sciences Inc. you can return your unopened item(s) in their original packaging for a full refund or exchange within 365 days of purchase. Returns must be unopened, in the state you received them, and in the original packaging. OPENED ITEMS: Allysian Sciences offers a 30 (thirty) day 100% (one hundred percent) unconditional money back guarantee on opened products. Allysian Sciences Inc. will refund, or exchange, opened and/or partially used products if returned within 30 days of the purchase date. RETURN MERCHANDISE AUTHORIZATION NUMBER: Before returning any item you must obtain an RMA number to be placed on the return package. Please contact us at support@allysian.com or toll free at 1-844-728-0678 and we will supply you, within one business day, with an RMA number and our return address. Returns without an RMA number or to the incorrect address will not be accepted. If you purchased an Allysian Sciences Inc. product directly from an Independent Affiliate or Distributor (it was not shipped from an Allysian Sciences Inc. location) and are not satisfied, you MUST return the product to your place of purchase. SHIPPING FEES: The original shipping fees, if any, are non-refundable, and the cost of shipping for the return of your shipment, if any, is at your expense. However, the cost of shipping any exchange items back to you will be covered by Allysian Sciences Inc. Please ship returns only with a trackable shipping method and note the tracking number of your return.